This site is situated on a wide, gently sloping terrace at moderate elevation. 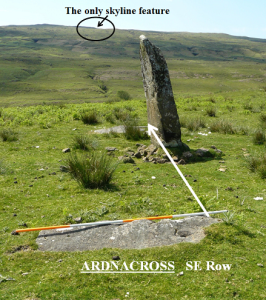 It consists of two, three stone rows and the remains of three kerb-cairns between them. (note). 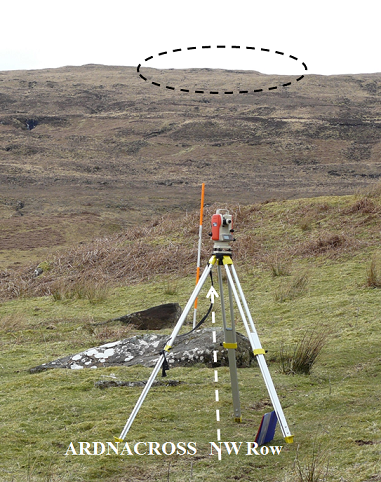 The two rows are approximately parallel to each other, orientated NNE/SSW, and about 30 metres apart. They are not opposite but are skew to each other. i.e. not an avenue. Only one of the six stones is still standing but an indicated direction to within a few degrees can be deduced. There is no alignment in the north. In the south there is only one possible foresight – a small but distinct downslope on the distant skyline. 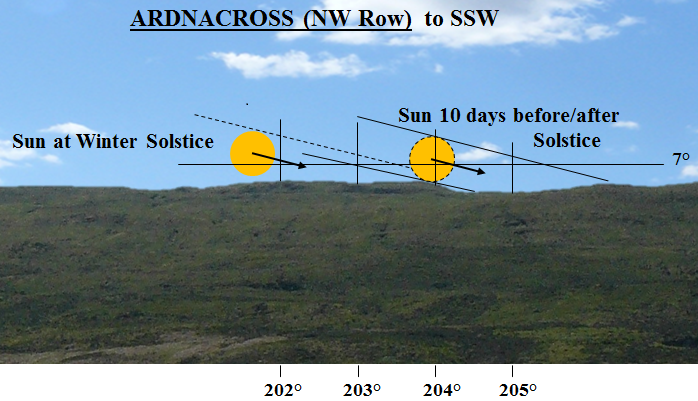 Each row gives a solar alignment using this feature; one for the upper limb, the other for the lower limb of the sun, each 10 days before/after the solstice. The only fixed times in the solar calendar are the solstices and it would be necessary to know when they occurred in order to set up the calendar. Thereafter it would be desirable to know them in order to keep a check on the calendar use. This can in principle and with difficulty be done by using a very long alignment to determine the actual day of the solstice by observation of the very small movement of the sun near the solstices. Variable refraction would be a potentially serious matter. Ballochroy in Kintyre and Kintraw in Argyll may be of this type. 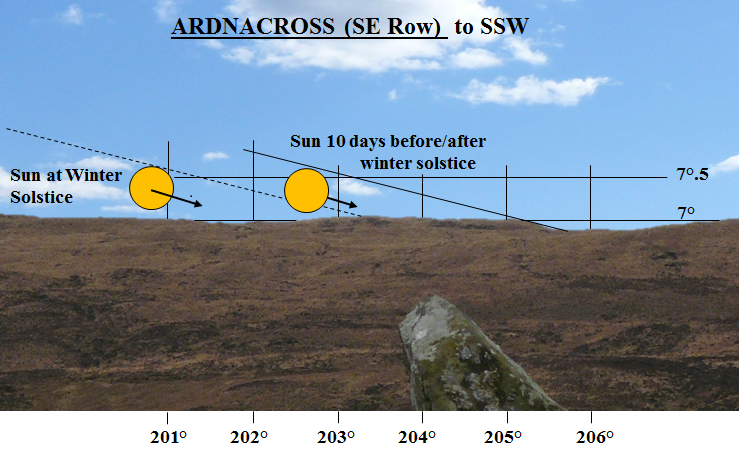 Alternatively the method used here of ‘halving the difference’ whereby the sun is observed at a foresight a few days before and after the solstice is much easier. (See Discussion). Note This site was excavated by Roger Martlew and Clive Ruggles during 1989-91 (Ruggles 1999: 112-115). 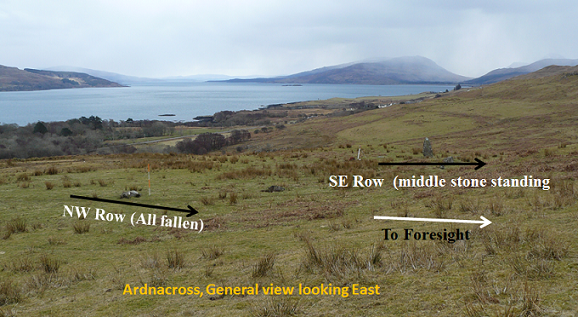 This was done as part of a study of the stone rows of northern Mull. The orientations of the rows was assessed; the possibility of indicated foresights and of alignments was not considered.